Hi, everyone today we discuss another very important topic which you face during doing job in your company or facing the interview session. How to Vlookup merge data from one sheet to another Excel worksheet? The answer to this query is either you have to use copy and paste method or you can also use use MS Excel’s most popular “Vlookup” function to easily merge or combine another sheet data into different sheet. This function is found in the lookup and reference category of Microsoft Excel So have a look and take few easy steps to easily overcome this kind of problem. The Microsoft Excel VLookup function search a value in the extreme left column of the table_array and provide the value in the same row which is based on the index_number. Range_lookup: It is an options part of this function. Type the following column headings and related data in another sheet: Employee_DetailA2= “Emp_ID”, B2= “Company Name”, C2= “Emp_Name”, D2= “Email ID”, E2= “Mobile Number”, F2= “City”. Note: Always remember first column of both sheets have the same data, on which you can easily look up your data from another sheet. 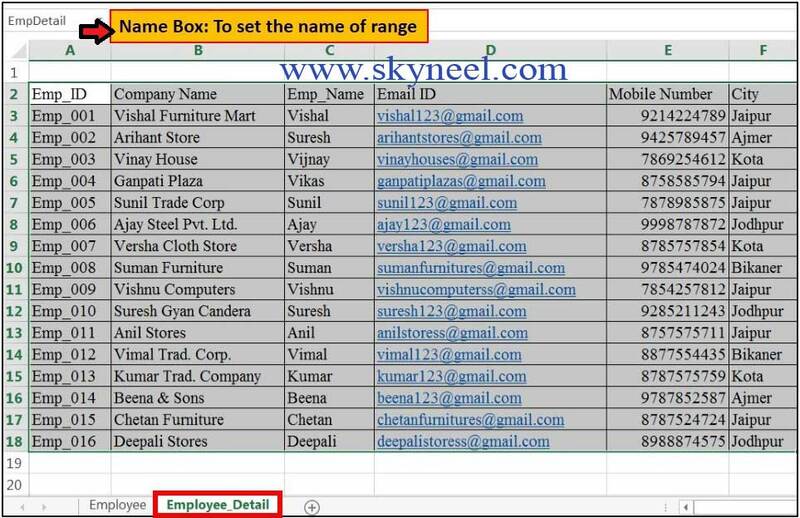 Step 2: Select the data of “Employee_Detail” sheet from the range of cell A3: F18 and set the name “EmpDetail” from the Name box window. 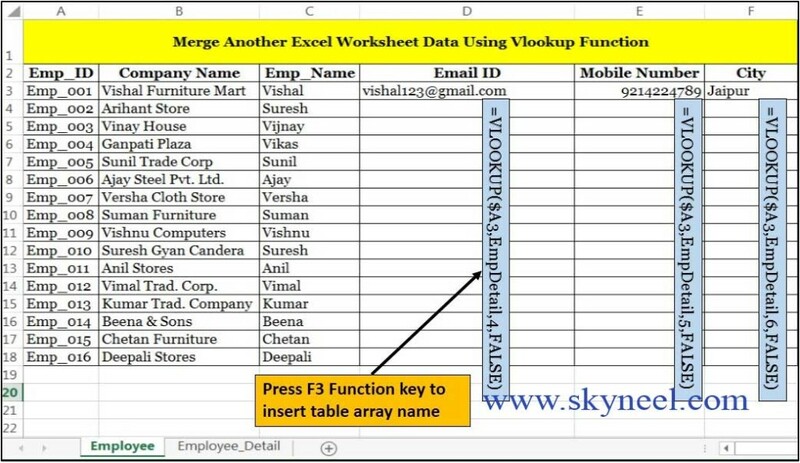 Now, if you want to merge Employee_Detail sheet data into the Employee sheet, then you have to use VLookup function. Note: Press function key F3 to insert table array name during typing the Vlookup formula in cell D3. Step 4: Now, select the cell D3 and double click on the fill handle button or drag the fill handle button from the mouse up to cell D18 to copy the formula. Step 5: To bring mobile number data from the Employee_Detail sheet into the Employee sheet, then click on the cell E3 of Employee sheet and type the following given formula in cell E3 =VLOOKUP($A3,EmpDetail,5,FALSE) and copy this formula up to cell E18 to view the result. Step 6: To bring city data from the Employee_Detail sheet into the Employee sheet, then click on the cell F3 of Employee sheet and type the following given formula in cell F3 =VLOOKUP($A3,EmpDetail,6,FALSE) and copy this formula up to cell F18 to view the result. I hope you like this How to Vlookup merge data from one sheet to another Excel worksheet guide from which you will be able to easily Vlookup merge data from one sheet to another Excel worksheet. Please give your important suggestion in the comment box and also share this article with your colleague, friends, staff members and others. Thanks.